I aspire to increase standards for applied research with First Nations in Canada through the use and promotion of collaborative and participatory action research methods and to publish in a manner that is accessible to academics and non-academics alike. 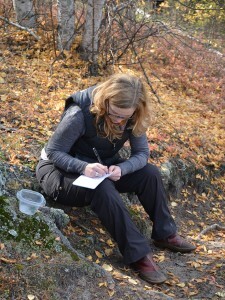 I am a PhD student in anthropology at McGill University and my doctoral research is on Cree perspectives of wild food contamination in Alberta’s oil (bituminous) sands region. This topic is inspired from eight years of working as a traditional land use consultant for First Nations communities in Canada. Traditional Land Use (TLU) assessments are a result of the Canadian Government’s legal obligation to consult First Nations regarding the potential impacts of industrial developments on Treaty rights. First Nations members repeatedly express their concerns about wild food contamination, without meaningful consideration from the scientists hired to represent companies and government. I became aware of the unbalanced relationship between researchers such as myself and the people sharing their traditional environmental knowledge. I realized that researchers in the consultation process extract knowledge from First Nations participants much like companies extract bitumen from the ground. Traditional environmental knowledge is taken out of context to be included in environmental impact assessments that ultimately achieve project approval for proposed developments. This exchange in the form of negative reciprocity, violates First Nations protocols and expectations for good behaviour: if someone shares wisdom, meat, fish, medicine, or berries with you, you need to also share something with them. My research is an attempt to balance the scales of respect and reciprocity; to give back to the people who shared with me while I was paid to do traditional land use work by recording their concerns, observations, knowledge, definitions, and indicators for wild food contamination. Meanwhile I am working with the communities to test wild food samples that they collect for contaminants associated with oil sands developments. 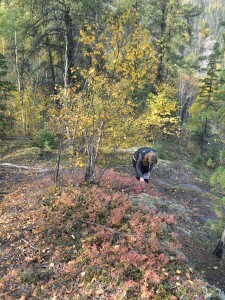 Picking cranberries (Vaccinium vitis-idaea) in Fort McKay First Nation’s traditional territory in northern Alberta, Canada. Fort McKay is the community most impacted by oil sands developments. Taking notes on Fort McKay First Nation member’s concerns about berry contamination in northern Alberta, Canada. 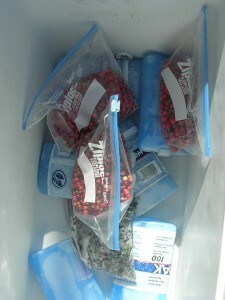 Blueberries (Vaccinium myrtilloides) and cranberries (Vaccinium vitis-idaea) ready for testing for contaminants related to oil sands extraction in Fort McKay First Nation’s traditional territory.